Having taken the enterprise by storm, iPads are now in the hands of workers in virtually every level of companies in almost every industry. 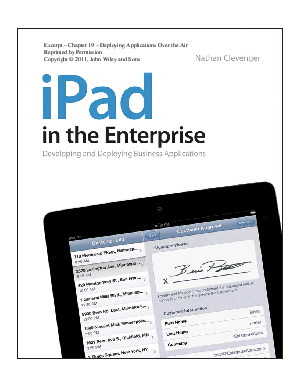 But using iPad apps in the enterprise is more complex than simply clicking an icon from the App Store. It presents unique challenges around software development, system integration, information security, application deployment, and device management. That's where this book comes in. iPhone Life Enterprise Editor and veteran mobile consultant Nathan Clevenger presents a guide for developing a mobile strategy to properly take advantage of this transformative technology. You'll learn about the high-level software architectural options, the importance of design and user experience, application development tools and techniques, and best practices for deploying applications and managing iPads in the enterprise.